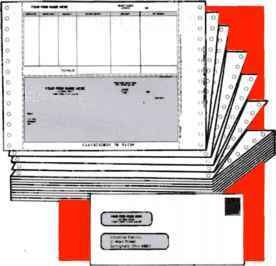 DISK PAYROLL computes FICA, Federal and State taxes. State tax is calculated on a percentage of the gross pay and can be customized for your particular state. Will allow use of City tax and/or other deductions. Utilizes printer for reports such as Payroll Register, which Includes current payroll, quarterly and year-to-date figures and the Payroll Account Summary, which prints a department breakdown for cost accounting and gives a recommended tax deposit.